During the initial steps of implantation, the mouse uterine epithelium of the implantation chamber undergoes apoptosis in response to the interacting blastocyst. With progressing implantation, regression of the decidual cells allows a restricted and coordinated invasion of trophoblast cells into the maternal compartment. In order to investigate pathways of apoptosis in mouse uterine epithelium and decidua during early pregnancy (day 4.5–7.0 post coitum), we have investigated different proteins such as TNFalpha, TNF receptor1, Fas ligand, Fas receptor1, Bax and Bcl2 as well as caspase-9 and caspase-3 using immunohistochemistry. To detect cells undergoing apoptosis the Tunel assay was performed. Immunoreactivity for TNFalpha as well as for TNF receptor1 was observed exclusively in the epithelium of the implantation chamber and the adjacent luminal epithelium from day 4.5 post coitum onwards. In the developing decidua the Fas ligand, but not the Fas receptor, was expressed. Bax and Bcl2 revealed a complementary expression pattern with Bax in the primary and Bcl2 in the adjacent decidual zone. Strong immunolabelling for the initiator caspase-9 was restricted to the decidual compartment, whereas caspase-3 expression characterized the apoptotic uterine epithelium. Only some caspase-3 positive decidual cells were found around the embryo which correlated to the pattern of Tunel staining. Taken together, the apoptotic degeneration of the uterine epithelium seems to be mediated by TNF receptor1 followed by caspase-3, whereas the very moderate regression of the decidua did not show the investigated death receptor, but Bax and Blc2 instead and in addition caspase-9, which indicates a different regulation for epithelial versus decidual apoptosis. Early pregnancy in rodents is characterized by a progressive interaction between the embryo and the maternal compartment. 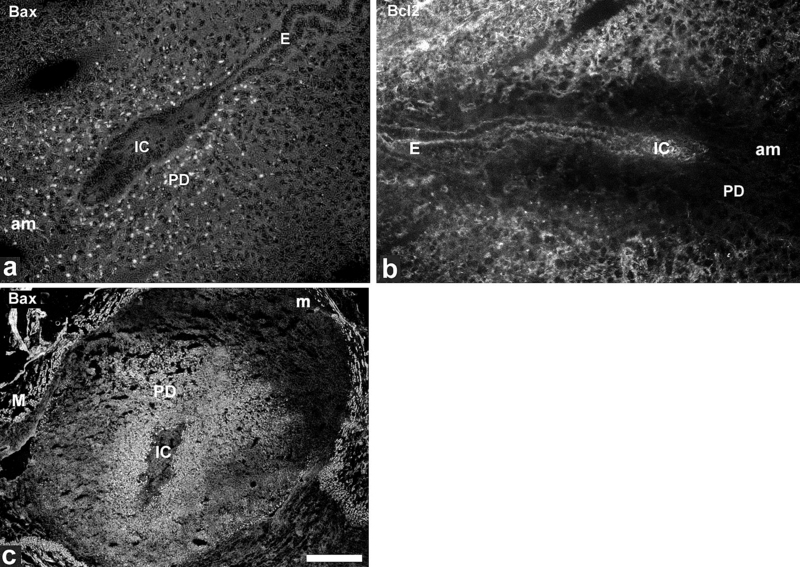 Invasiveness of the trophoblast and permissiveness of the endometrium is balanced leading to the establishment of a placenta with limited extension into the uterus. It is assumed that the invasiveness of trophoblast cells is guided by the endometrial compartment. Implantation in rodents starts with apposition of the blastocyst and adhesion of the trophoblast to the receptive uterine epithelium. It is well documented that the rodent uterine epithelium around the embryo undergoes apoptosis in response to the presence of the blastocyst [1–3]. Though the trophoblast cells interact with a still healthy uterine epithelium, the cells seem to be already detached from the basal lamina . As a consequence the trophoblast reaches the basal lamina without the need of being highly invasive. This modus of implantation is typified as a displacement penetration. The blastocyst signals, which induce the apoptotic cascade as well as the genes which regulate this local event, are still unkown. Degeneration of the uterine epthelium surrounding the implantation chamber starts at the antimesometrial pole and is followed by the mesometrial side, which is not in direct contact with the embryo. It remains to be clarified, if this coordinated cell death within the chamber and adjacent luminal epithelium is synchronized by locally induced direct cell-cell communication, which is resricted to the epithelium of the implantation chamber and the adjacent luminal epithelium during this phase . In the following, the polar trophectoderm starts to invade the developing decidua to reach maternal blood supply and to establish a nutrition route. This process is accompanied by a stepwise regression of the decidual tissue . The epithelium and the developing decidua regulate the invasiveness of trophoblast cells by coordinated cell death. This well organized form of cell death requires the involvement of biochemical events, which have been extensively investigated during the past decade leading to the description of defined cascades, which seem to be regulated in a cell specific manner [7, 8]. There are two major ways to activate proteases from the caspase family for execution of apoptosis. The extrinsic pathway involves the death receptors and their ligands. Best investigated are the Fas ligand (FasL), Fas receptor (FasR), and the TNFalpha with its receptors TNFR1 and TNFR2 . The so-called intrinsic pathway induces oligomerization of the cytosolic factor (Apaf-1) and apoptosome formation by cytochrome c release from the mitochondria . In both pathways the death inducing signal complex or the procaspases 8 and 9, recruited by the apoptosomes, are activated . These caspases subsequently cleave and activate the execution caspases, which induce an irreversible degradation of the cell . Execution of caspase activation is highly regulated by the Bcl gene family, which comprises about 21 isoforms . Some of these Bcl proteins are known to be involved in the inhibition of apoptosis (e.g. Bcl2 and Bcl-Xl), whereas others (e.g Bcl-Xs, Bak, Bax and Bad) promote cell death. The competition between both groups leads to a regulation of the apoptotic process. Both act downstream of the death receptors, but in addition could act independently from this preceding signalling [12, 14–16]. Bcl2 prevents the release of cytochrome c from mitochondria, which acts as a cofactor for the activation of caspase-9, and binds Apaf-1. Both events inhibit the activity of caspase-9 . It has been shown that Bax and Bcl are involved in the regulation of decidual cell apoptosis in pseudopregnant rats . Recently, Dai et al. could demonstrate in rats that regression of the decidual cells at the mesometrial pole in early to midpregnancy is related to expression levels of Bax and Bcl2 proteins, respectively. Furthermore, the ratio of both protein levels determines the amount and spatial distribution of apoptosis. This balance is regulated by progesterone, since the application of an antagonist resulted in a higher Bax to Bcl2 ratio and enhanced decidual apoptosis. In addition, the deciduomata of pseudopregnant mice showed a regression of the decidua from day 8 pc onwards, which was accompanied by an increasing level of the death receptor ligand TNFalpha. At least the excecutive caspases, such as caspase-3 and -7, determine the start of cell death by cleaving a broad panel of proteins critical for survival like PARP and nuclear lamins . To further elucidate members of the apoptotic cascades involved in uterine epithelial as well as in the decidual programmed cell death, we have investigated the expression pattern of several apoptotic proteins such as TNFalpha, TNFR1 and another member of the TNF receptor family, the Fas receptor with its corresponding ligand. Furthermore Bcl2 as well as Bax, which have been shown to be regulators for decidual apoptosis in later stages of implantation, were included in these investigations. In the caspase family we have focused on the active form of caspase-3 and the initiator caspase-9, which both lead to severe apoptotic failures if deleted in mice [21, 7]. To indicate cells at the end of the apoptotic process the Tunel assay was performed. During coordinated replacement of the invading trophoblast we found evidence that around implantation the uterine epithelium and decidua seem to take another pathway to end in the same biological event of programmed cell death. Mice (C57bl/6, Zentrales Tierlabor, Medical School, University of Essen, Germany) were kept under 12 hr light/12 hr dark cycle in the laboratory animal care facility. All experiments were carried out in accordance to German laws for animal protection. Female mice were mated overnight with males of proven fertility. Pregnancy was identified by the vaginal plug (0.5 dies post coitum, dpc). A minimum of three nonpregnant or pregnant animals on day 4.5/ 5.0/ 5.5/ 6.0/ 6.5/ 7.0 pc were investigated. The mice were killed by cervical dislocation. Early implantation sites were discovered by injection of 0.5 ml pontamine blue (1%) into the tail vein. After removing the uterus, implantation chambers were dissected. A minimum of three implantation chambers have been investigated per animal. Tissues embedded in tissue teck (Satura, Zoeterwoude, NL) were rapidly frozen in liquid nitrogen and sections (9 μm) were obtained with a Leica cryostat (CM3050). Sections were shortly fixed (10 min) in ice cold absolute ethanol or 3.5% paraformaldehyde. After rinsing in PBS containing 1% bovine serum albumin, different primary antibodies (Table 1) were used for incubation (1 h) followed by the appropiate FITC or rhodamine conjugated secondary antibody. Controls were performed by omitting the primary antibody and using preimmune sera instead. Slices were covered with Vectashield (Vector Laboratories Burlingame, CA, USA) and examined using a photomicroscope (Axiophot, Zeiss, Oberkochen) equipped with epifluorescence or the Laser Scan microscope 510 (Zeiss, Oberkochen). The Tunel (terminal deoxynucleotide transferase mediated dUTP-biotin nick end labelling) kit was purchased from Roche, Molecular Biochemicals (Mannheim, Germany). In this assay, terminal deoxynucleotidyl transferase, which catalyzes polymerization of nucleotides to free 3'-OH DNA ends, is used to label DNA strand breaks. Incubation was done according to the manufacter's protocol. Briefly, cryostat sections were postfixed in 4% paraformaldehyde for 10 min and permealized with proteinaseK (1 mg/ml) on ice for 30 min and incubated with the reaction kit for 60 min at 37°C in the dark. The reaction was visualized by fluorescein labelled nucleotides. Controls were performed in the same way, but without reaction kit and on slices, which were treated with DNaseI in different concentrations (1 mg/μl-1 μg/ml) for 10 min before incubation with the Tunel kit. TNFalpha as well as the TNFR1 antigen were neither identified in a nonpregant uterus nor during preimplantation (data not shown). At implantation weak expression of TNFalpha was observed in the uterine epithelium on day 4.5 pc around the implantation chamber (data not shown), which was enhanced one day later predominantly in the epithelium of the mesometrial chamber (Fig. 1a,1b). On 6.5 dpc staining of the ligand was observed in the luminal epithelium, which started to degenerate with ongoing closure reaction (Fig. 1c,1d). The corresponding receptor was present in the uterine epithelium from day 4.5 pc onwards. On day 5.5 pc TNFR1 is strongly expressed in the epithelium of the implantation chamber and with less intensity in the adjacent luminal epithelium (Fig. 2a). Immunolabelling neither for the ligand nor the receptor could be detected in the decidua during these phases. Immunostaining for TNFalpha. 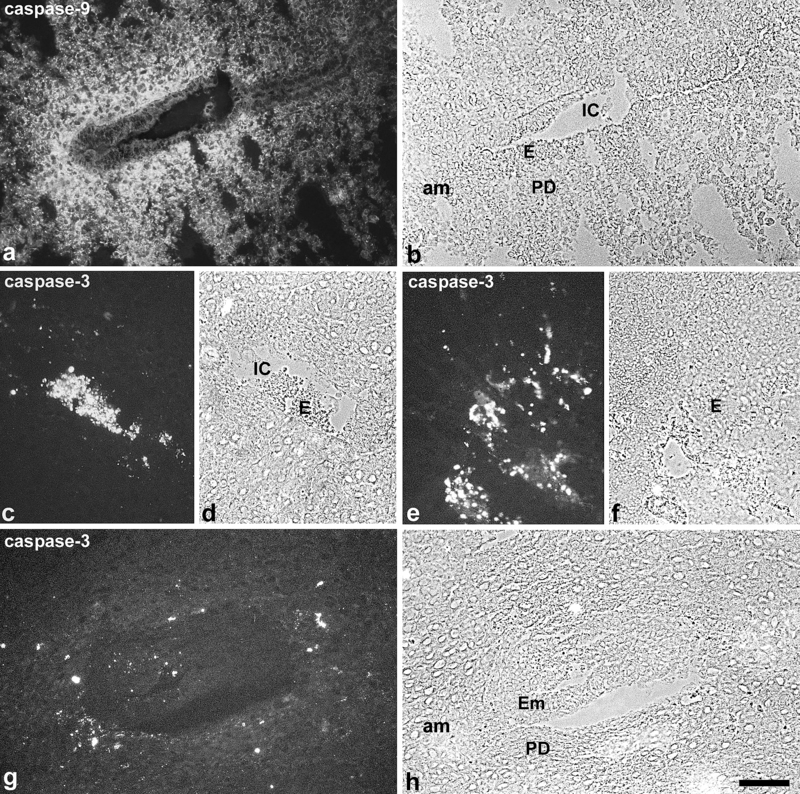 Immunoreactivity to TNFalpha is strongly expressed in the luminal epithelium close to the implantation chamber on day 5.5 pc (a, b). Staining for TNFalpha is enhanced on day 6.5 pc in the luminal epithelium (c, d). IC, implantation chamber; E, luminal luterine epithelium; m, mesometrial side. Bar represents 50 μm in a-d.
Immunostaining for TNFR1 (a) and FASL(b) TNFR1 is strongly expressed in the epithelium around the implantation chamber spreading out with decreasing intensity in the adjacent luminal epithelium on day 5.5 pc (a). On day 5.5 pc the FAS ligand is expressed in the developing decidua with a decreasing gradient from the implantation chamber. Staining intensity is enhanced at the antimesometrial side. IC, implantation chamber; E, luminal uterine epithelium; m, mesometrial side; am, antimesometrial side; PD, primary decidual zone. Bar represents 200 μm in a, b. The Fas ligand was not detectable in endometrial tissues in nonpregnant as well as in pregnant animals up to day 4.5 pc (data not shown). On day 5.5 pc FasL was expressed in the developing decidua (primary decidual zone) around the implantation chamber, and expression was enhanced at the antimesometrial pole (Fig. 2b). With progressing decidualization the expression pattern of FasL followed the decidualization process of the stromal cells. Both, FasL and FasR, were not present in the uterine epithelium, and immunostaining for FasR was not detectable in the decidual cells during all phases investigated. Bax and Bcl2 are well known counterplayers which regulate apoptosis. Immunostaining for Bax and Bcl2 was not observed in the endometrium of nonpregnant animals and during the preimplantation phase. At implantation Bax and Bcl2 exhibited complementary expression patterns. At day 4.5 pc the pro-apoptotic Bax protein showed restricted labelling in the primary decidual zone around the implanting embryo (Fig. 3a). This expression was enhanced and spread out from the primary decidual zone (data not shown). On day 6.5 pc Bax staining was seen throughout the whole antimesometrial decidua up to the myometrial wall, and Bax expression started at the mesometrial side (Fig. 3c). In contrast Bcl2 was not expressed in the primary decidual zone on day 4.5 pc (Fig. 3b) until day 6.5 pc, but was observed in the adjacent stroma. Its expression decreased from day 6.5 pc onwards (data not shown). Both proteins were not detectable in the uterine epithelial compartment (see Fig. 3a for Bax and Fig. 3b for Bcl2). Immunostaining for Bax/Bcl2 Bax reveals weak expression in the developing decidua, but not in the uterine epithelium of the implantation chamber on 4.5 dpc (a). At the same stage Bcl2 is not expressed in the primary decidual zone, but in the surrounding stroma (b). On day 6.5 pc distribution of Bax is predominantly observed in the antimesometrial decidua up to the myometrial layers, whereas the mesometrial side is only weakly stained (c). IC, implantation chamber; E, luminal uterine epithelium; m, mesometrial side; am, antimesometrial side; PD, primary decidual zone, M, myometrium. Bar represents 100 μm in a, b and 500 μm in c.
Among all the caspase family members, we have focused on the investigation of caspase-9 and the active form of caspase-3. Both proteins were not expressed in the endometrium of nonpregnant animals and during early pregnancy up to day 3 pc. The initiator caspase-9 was expressed in the developing decidua from day 4.5 pc onwards, and staining increased in parallel to the decidualization process. The uterine epithelium revealed no immunoreactivity (Fig. 4a,4b). The expression pattern in the stromal compartment was similar to Bax and FasL and followed the continuous process of decidualization from the antimesometrial side of the implantation chamber towards the mesometrial part and the myometrium (data not shown). Immunostaining for caspase-9 and caspase-3 Caspase-9 is expressed in the primary decidual zone around the implantation chamber on day 4.5 pc (a, b). Strong staining for the active caspase-3 is seen in the epithelium of the implantation chamber on day 5.5 pc (c, d) as well as in the adjacent luminal epithelium on day 6.5 pc (e, f). At day 6.5 pc some decidual cells of the primary decidual zone surrounding the embryo are marked by active caspase-3 (g, h). IC, implantation chamber; E, luminal uterine epithelium; am, antimesometrial side; PD, primary decidual zone; Em, embryo. Bar represents 100 μm in a, b and 50 μm in c-h. The active form of the effector caspase-3 was clearly detectable in the uterine epithelium only at implantation and exclusively in the epithelium around the implantation chamber and adjacent epithelium from day 4.5 pc onwards, leading to a strong staining of the degenerated cells on day 5.5 pc (Fig. 4c,4d,4e,4f). On day 6.5 pc some decidual cells in the vicinity of the implantation chamber exhibited strongly labelled granules (Fig. 4g,4h). Connexin26 expression is restricted to the epithelium of the implantation chamber and the adjacent luminal epithelium . To test if the extent of apoptosis in the epithelium is correlated to the localization of connexin26 expression we have performed double immunolabelling for both markers. First signals for DNA double strand breaks are detectable on day 5.5 pc in the uterine epithelium of the implantation chamber, which correlated to the connexin26 expression  (Fig. 5a, red). The apoptotic uterine epithelial cells were first detectable in the antimesometrial part of the chamber in close vicinity to the polar trophectoderm and spread out to the mesometrial side (Fig. 5a, green). In the stromal compartment only few cells showed apoptosis around the implantation chamber up to day 6.5 pc. On day 6.5 pc apoptotic cells in the primary decidual zone are lining the implantation chamber and were accumulated at the mesometrial pole indicating the remnants of the luminal uterine epithelium (Fig. 5b). Tunel staining On day 4.5 pc the epithelium which surrounds the implantation chamber is characterized by local expression of connexin26 with a decreasing gradient towards the luminal epithelium (red). At the mesometrial part of the implantation chamber apoptotic bodies (green) are observed in the epithelium (a). On day 7 pc the epithelium of the implantation chamber is degenerated. 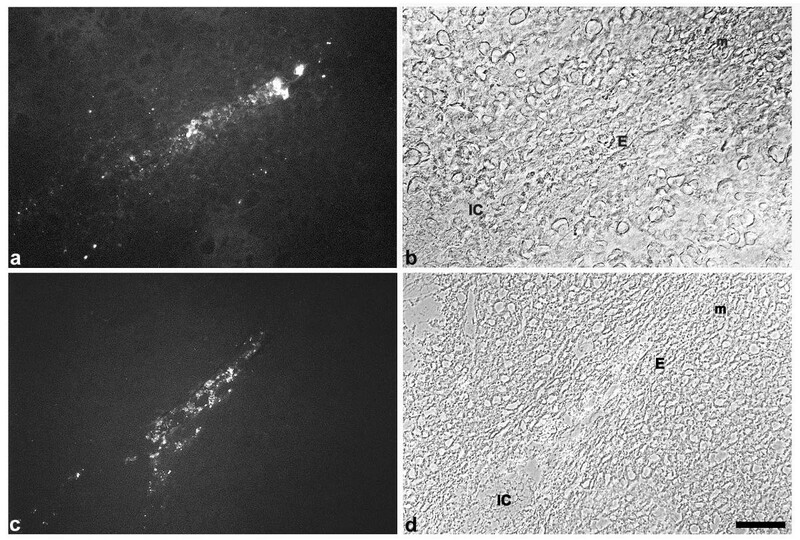 Some Tunel positive cells are detected in the adjacent luminal epithelium as well as in the primary decidual zone, predominantly at the antimesometrial pole (b). IC, implantation chamber; E, luminal uterine epithelium; PD, primary decidual zone; m, mesometrial side. Bar represents 200 μm in a, b. At early implantation the epithelium around the implantation chamber undergoes rapid apoptosis in response to the presence of the embryo. In addition, the luminal epithelium adjacent to the implantation chamber degenerates with further decidualization. Both regions showed expression of the death receptor TNFR1 and its ligand TNFalpha prior to implantation. Due to the localization of the receptor and its ligand in the same cell population, a paracrine or autocrine mechanism has to be taken into account. In the epithelium of the mesometrial chamber, however, the ligand is strongly expressed, whereas the receptor is predominantly found in the anti-mesometrial chamber. This could explain that apoptosis of the epithelium starts at the antimesometrial implantation chamber. Only the Fas ligand, but not the receptor, could be demonstrated in the mouse decidua, and the expression pattern followed the decidualization process starting in the primary decidual zone at the antimesometrial side. The possible function of FasL has been already convincingly demonstrated by Hunt et al. . The authors gave evidence by investigating gld mice, lacking functional FasL, which lead to infiltration of neutrophils and macrophages into the decidua. Both cell types expressed FasR and are normally eliminated by the interaction of FasR and decidual FasL. Thus FasL seems to be responsible for the restriction of neutrophils and macrophages from the placenta and embryo, but seems not to be involved in the apoptotic pathway of the decidual cells. Though TNFalpha was not detected in the decidua around implantation in our study, Hirabayashi et al. described expression of TNFalpha in deciduomata of pseudopregnant mice from day 8 pc onwards, which seemed to be downregulated by progesterone. The question if the upregulation of this death receptors is related to a more enhanced regression of the decidua in later phases of pregnancy will be of interest for further investigations. It has been shown by several groups that Bax and Bcl2 seem to be important for the regulation of decidual cell apoptosis in artificially induced deciduomata [6, 18]. Furthermore, Dai et al. investigated Bcl2 expression in the rat decidua from day 8 pc onwards and demonstrated that the Bcl2 pro-survival protein is highly expressed between day 8 and 10, and expression drops down very quickly thereafter. Similar to these observations, we could show in our study that Bcl2 was highly expressed in mice decidua in the early stages of implantation, and Bcl2 expression disappeared already on 6.5 dpc. In mice the Bax expression pattern is very prominent in the primary decidual zone but lacks Bcl2. This spatial expression pattern within the decidua could make the decidual cells close to the expanding embryo more susceptible to commit suicide. We could confirm the presence of Bax and Bcl2 in mouse decidua and could in addition show that both were absent in the uterine epithelium. Since there is no evidence for the presence of common death receptors in the primary decidual zone, it has to be considered that Bax could act in a receptor independent manner by cytochrome c release from the mitochondria. Members of the caspase cystein protease family have distinct biological functions  and can be subdivided into three groups: mediators in inflammation, effectors or activators of apoptosis. In our system the activator caspase-9 was strongly expressed in the decidua, but not in the epithelium where the effector caspase-3 was prominent. The decidua revealed only some caspase-positive cells around the implantation chamber. This effector caspase could probably be activated by caspase-9, but it remains to be explained how caspase-9 is able to activate caspase-3 only in some cells of the primary decidual zone leading to a very moderate regression of the decidual cells. In pseudopregnant rats Tessier et al. have shown that apoptosis of decidual cells is mediated via caspase-3 . They found evidence that PRL expression inhibits apoptosis, but requires an intact protein kinase B pathway. The Tunel staining impressively marked the uterine epithelial cells in the implantation chamber starting at the antimesometrial pole and spreading out to the degenerating epithelium adjacent to the implantation chamber. This epithelium is characterized by a local expression of connexin26 as a response to embryo recognition in rat and mouse [5, 22]. This could point to a coordination and limitation of programmed cell death by these intercellular channels, which form a distinct communication compartment to the uterine epithelium outside the implantation process during early pregnancy. In mice, apoptotic decidual cells are rarely observed during this time. At day 6.5 pc only a necklace of apoptotic cells in the primary decidual zone surrounds the expanding embryo pointing to a moderate regression of the decidua at this time. In principle there seem to be two pathways of apoptotic events during implantation. First, the programmed cell death of the surrounding uterine epithelium seems to be induced via TNFalpha and TNFR1 followed by activation of caspase-3 leading to epithelial apoptosis within a short period. Second, a very moderate spatially and temporally regulated apoptotic process of the decidual tissue seems to require a complementary localization and expression of Bax and Bcl2 and the presence of caspase-9. Both, TNFR1 or FasR, are lacking in the decidua at this phase, which could point to a death receptor independent pathway. This work was supported by the internal grant IFORES of the Medical School, University of Essen, Germany.